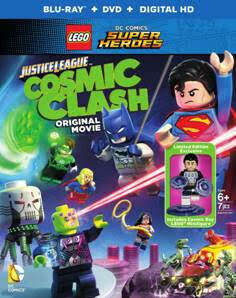 It will take all the efforts of the Justice League – and a few of their super pals – to keep Brainiac from adding Earth to his miniaturized collection of planets in the all-new animated feature, LEGO DC Comics Super Heroes – Justice League: Cosmic Clash. Produced by Warner Bros. Animation, DC Entertainment and the LEGO Group, the film will be distributed on Blu-rayTM Combo Pack, DVD and Digital HD. The Blu-rayTM and DVD releases will include an exclusive Cosmic Boy LEGO® figurine, while supplies last. This DVD combines two of my son's favorite things, LEGO and Super Hero characters. He has a number of Super Hero LEGO sets and all hyped up for the newest Super Hero movies hitting theaters soon, so of course was excited to watch this DVD! It totally geared him up and he now wants more LEGO sets! Purchase LEGO DC Comics Super Heroes: Justice League - Cosmic Clash on Amazon for $12.99 & FREE Shipping on orders over $49. If you purchase the 2-disc Blu-ray/DVD Combo Pack , there is a special feature: “The Justice League: Caught on Camera.” It is a super cute and funny gag reel of mistakes, my son loved this!. The deluxe Blu-ray/DVD edition comes with a Cosmic Boy LEGO mini-figure., so it is an added bonus in itself!